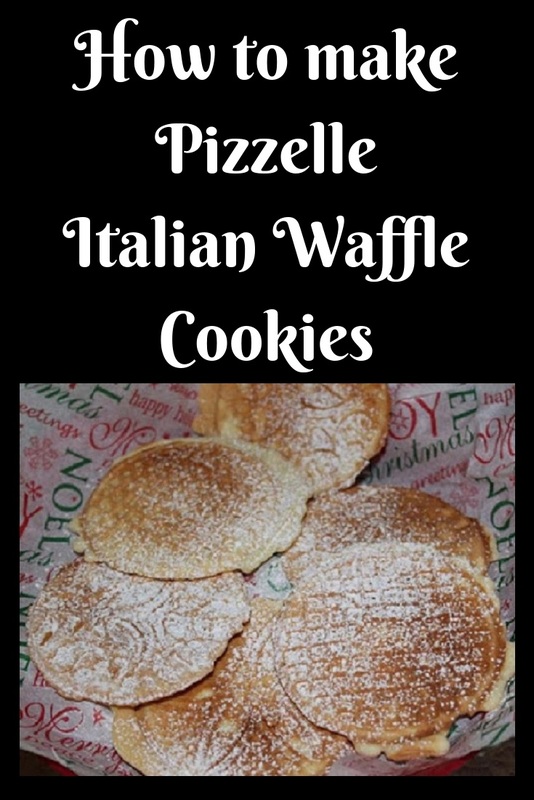 Grandma's recipe for Italian pizzelle waffle cookies, go back 100's of years now, and this recipe remains the same year after year. These are very thin crispy waffle cookies made in many flavors, anisette being the most popular! Every year at Christmas time, Grandma, mom and I would make over 50 to 60 waffle pizzelle cookies and give them away to family and friends. A great tradition I still make every year at Christmas. Delicate. Thin. Crispy. Wafer waffle cookies. This is how I would describe this classic, authentic, Italian cookie. These are a delicious traditional waffle with a delicate taste of anisette. Through the years we have tried all kinds of flavors. Lemon, almond and anisette remain our favorites. Dusted with powdered sugar and the perfect thin cookie for espresso and snacking on. 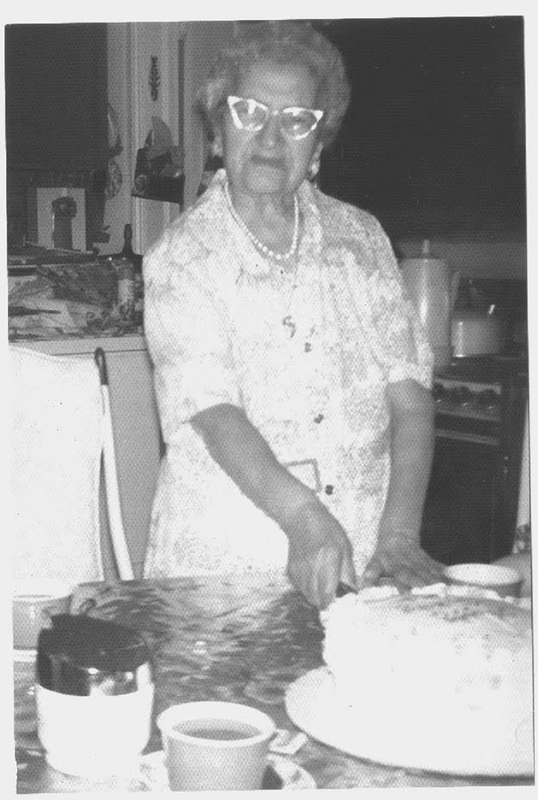 Grandma Victoria Ferraro Colenzo was all about tradition. She came from Rome, Italy on a boat at 15 years old. My grandmother Victoria was a great cook and lived to be 94. Because of her wonderful teachings, my children and I continue the traditions at Christmas time making these waffle classic cookies. I love this Traditional Christmas Cookie Pizzelle! Now we carry on this tradition every Christmas. One of my favorite memories of Grandma and Christmas time we shared. She also made rosettes with all kinds of flowers with a hot waffle iron that were almost like a fritter batter, not to be mixed up with this one. She would dip the hot iron into a thin batter and deep fry what looked like flowers and then sprinkled with powdered sugar like the pizzelle but they were fried. 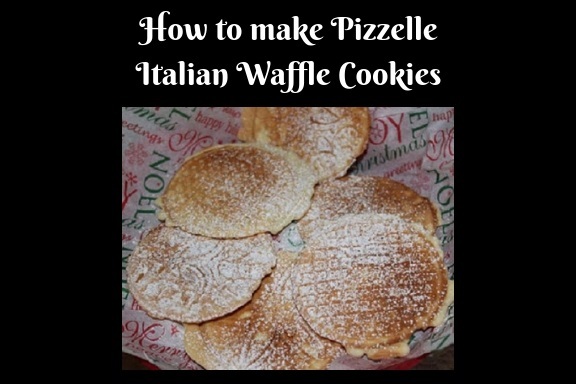 According to history, the first pizzelle cookies were made in the region of Abruzzo (geographically located in Central Italy) back in the 8th century. These highly recognizable Italian cookies get their shape by flattening the batter between two hot iron plates (just like waffles). These plates (rectangular or round) often had the pattern of the family crest engraved on them. I usually make several of them ahead of time, put wax paper between, stack them and freeze them until ready to pass out for gifts at Christmas time. These never got soft as some recipes do. These light waffle style cookies are perfect in clean round plastic coffee cans to hold their shape. In years past we used an old fashion cast iron mold poured the batter into the mold and baked them. They are often found at Italian weddings, alongside other traditional pastries such as cannoli and traditional Italian cookies. It is also common for two pizzelle to be sandwiched with cannoli cream (ricotta blended with sugar) or hazelnut spread. Pizzelle, while still warm, can also be rolled using a wooden dowel to create cannoli shells. t just wouldn't be Christmas without these special pizzelle cookies and making them in grandma's memory. Now with modern technology, you can buy these relatively cheap online and electric pizzelle makers result in perfect size and color. You can find the waffle maker on my affiliate link above in Shop with me. Homemade is the best and Tips! Using a full gravy ladle holds the perfect amount of pizzelle batter for each cookie. When they are lightly browned lift off with a silicone spatula not to scratch the pizzelle maker. This batter is very thick as you can see it holds on to the spatula and shouldn't be runny. Lightly spray with cooking oil for easy release. I usually make several of them ahead of time and freeze in plastic coffee containers. For gift giving use pretty tins. They Stay Fresh for Weeks! These light waffle style cookies are great any time of the year but exclusive around Christmas and Easter times.. In years past we used an old fashion iron dipped in batter and dropped in oil. Now with modern technology, you can buy these relatively inexpensive online electric pizzelle makers result in perfect size and color. You can make these any flavors your family likes. Start your own cookie traditions and make this a great family project. Everyone loves these pizzelle cookies and the memories will last a lifetime as they did with Grandma and me. These are a classic wafer thin cookie sometimes flavored with lemon or anisette made at Christmas time. An Italian traditional cookie called pizzelle. Beat the eggs on medium speed until thick. Add the oil, shortening and softened butter and mix until combined well. Add the extracts, ( you can add any flavor you want, anisette, vanilla, orange, maple, peppermint, lemon or coconut can be used, however, traditionally anisette is the flavor. Reduce the speed to low and gradually add the flour, mix till well Incorporated. Preheat the electric pizzelle iron according to the manufacturer’s directions (can be found online). When ready, drop batter by a heaping tablespoon or use a gravy ladle, again follow the pizzelle manual. When ready, open iron and remove pizzelle. Stack on wax paper in between till cooled. Repeat until all batter is used. those are beautiful. I bet they taste great! Pizzelles are another food thing we have in common from our childhood. I remember my grandmother making these with an iron that only made one cookie at a time over a gas flame. Now we have electric makers that are easier and make 2 at once but somehow, even though we use the same recipe that our grandmothers used, our electric pizzelle makers lack that special touch of our grandmothers and aunts. Still, it's important that we still make these cookies, they are a very important cookie in the Italian culture and we have to make sure our kids know how to make these......and they ROCK with a cup of coffee or tea. @kathy vegas you are so right, my son now makes them all kinds of flavors, he loves putting coconut flavoring and shredded coconut in the batter its awesome! thanks for sharing your wonderful family values also! They look so yummy, wish I can have a wee bit. Just irresistable! Omg, they are beautiful, and MUCH prettier than the ones I buy at the Italian market. If you sold these , you would become a pizelle millionaire! Your grandma is so cute. What a wonderful and beautiful holiday tradition you've shared, thank you so much!--I would love to try these! And the fact they will stay crunchy is even better. They are just gorgeous to look at with all the detail. Yum! very much enjoyed this one, though it made me long for my years spent in italy- how i miss those yummy cookies! love to hear about family traditions staying alive, and this one is a great one. Yum!!! Oooh...and I love grandma's glasses - -She's a fashion diva -- Love it! Wow, it's just amazing that this recipe has been in your family all those years and that the tradition is continuing with you. I hope it continues for generations to come. Oh I love pizzelles, but have never had anise ones! So jealous, these sound amazing. This sound so good! I buy the olive oil and fennel sweet crackers from Spain but now I know that Italy has their version which makes me very happy! I'll have to try these someday. @kathyvegas I have to tell you that you brought tears to my eyes. I am not sure whats harder to miss the ones that made this, or continue in their legacy...but you certainly made the meaning of carrying on their tradition allot more meaningful with your heart warming words....my grandmother and mom would be smiling right now as I am with your wonderful compliments to their work! I really, really need to buy a pizzelle press! These are beautiful!!! We always get some of these at the Christmas market. I really need to try making them myself. Wow I have never heard of these! They look delicious though, and the designs are so intricate..they look beautiful! I've never made my own pizelle cookies before, but they sound like my cup of tea. Gotta get a press. These are my favorite cookies this tie of year! I can't wait to make them! These look amazing, Any recipe from grandma has got to be delicious! 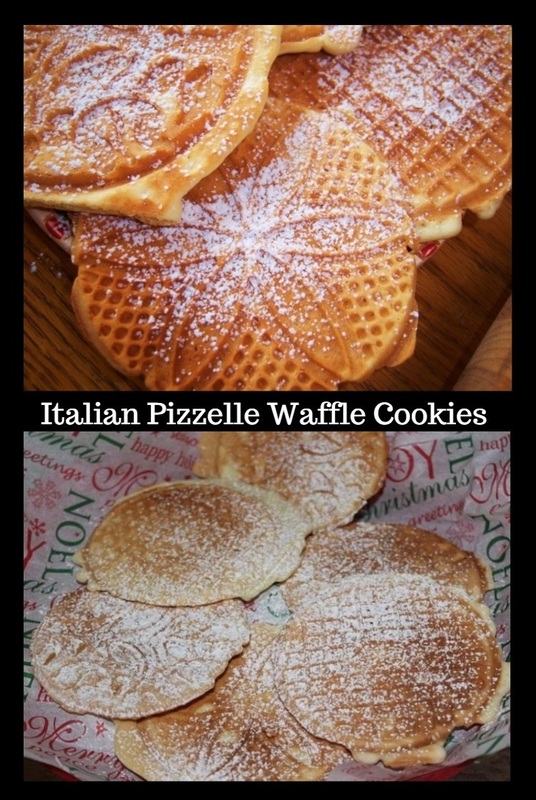 I definitely need to get a pizzelle iron now! Awww grandma is so sweet! I LOVE waffle cones - I need to make these! I only can imagine how good they taste and smell. I love the anisette flavor and I need to make these cookies immediately! Girl, if you left me alone with these they would be all gone too! So many awesome flavors going on in here! Love!! I love that you are carrying on the tradition. 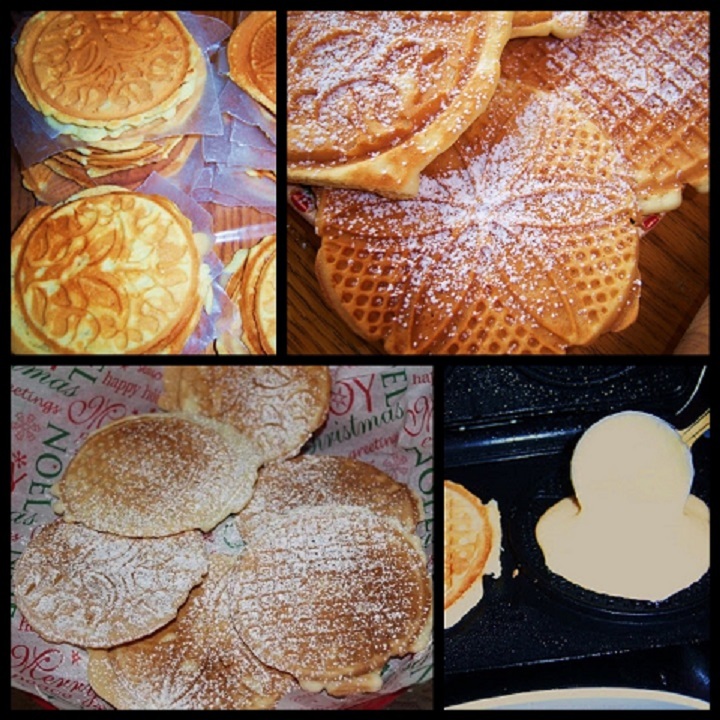 Pizzelles are one my favorites but I haven't tried making them myself until now. So excited to try this recipe! Grandma's recipes must be the best! And when you talk about 100s of years - that is just incredible!